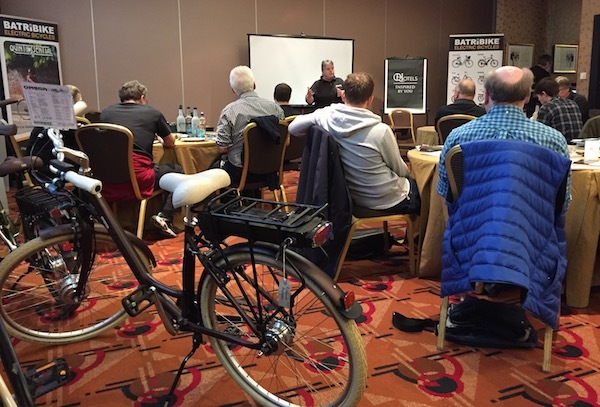 Last week Batribike held Dealer Conferences in two parts of the country, one in Leeds and one in Swindon. Supporting our dealers and giving them the best insights into our products is important to us. We were delighted to welcome two representatives from ProMovec the Danish company that supplies the electrics for our new European range of electric bikes. 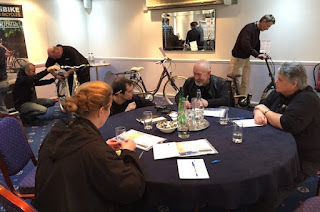 Technical presentations explained way the component parts of the system interact with each other and how a new battery analysing device will allow dealers to check customer’s batteries. The data ProMovec has been able to collect from battery analysis in the past has given them high confidence in their batteries. This has led to an excellent 2 year warranty as standard which is upgradable to 5 years, also in an unprecedented move these warranties are transferable. A chance meeting outside the Swindon venue gave Revd. Trevor Day a chance to try the Omega. He had been attending an armistice service at the Lydiard Park Field of Remembrance. It was his first time on an electric bike and he was extremely impressed. Revd. Day is a part-time Minister for St Mary's Lydiard Tregoze and also the Sea Cadets.